Trust us: this apple crumble topped with Naturally Friendly’s® Vanilla Caramel is as good as it looks. In a large bowl, combine apples, cinnamon and lemon juice. Melt butter and honey in a sauce pan over low to medium heat. Stir to combine, turn off heat and set aside. In a medium bowl, combine old fashioned oats, salt and milled flaxseed. Then add the butter mixture and stir to combine. Grease an 8-inch square or 9-inch round baking pan with non-stick cooking spray. Place the apples into the pan, then evenly layer the oats mixture on top with a large spoon. Bake for 50–60 minutes or until apples are soft. 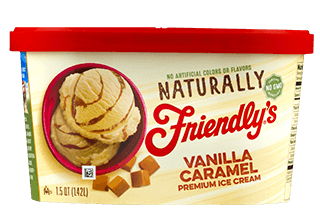 Let cool slightly and serve warm with 1 or 2 scoops of Naturally Friendly’s® Vanilla Caramel ice cream. The combination of vanilla ice cream and a caramel swirl makes this flavor almost too good to be true.